The vascular activity is tonically regulated by two major hemodynamic variations: a force parallel to the vessel wall generated by blood flow brushing against the endothelial layer termed as shear stress and a force perpendicular to the vessel wall resulted from blood pressure termed as tensile stress. Shear stress is sensed by various types of ion channels and membrane receptors as well as adhesion proteins, glycocalyx, and primary cilia on the cell surface. The acute activation of these mechanosensory receptors leads to altered vascular activity, while chronic change in shear stress results in adaptive structural remodeling of the blood vessels. 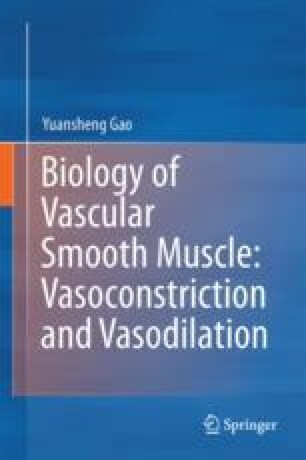 An increase in blood pressure causes increased stretch of vascular smooth muscle cells (VSMCs) and vasoconstriction, while a decrease in blood pressure causes vasodilatation. This phenomenon is known as myogenic response. Vascular myogenic response is initiated by the opening of mechanosensitive ion channels such as TRPC6 channel, TRPM4 channel, and probably a heteromultimeric channel complex formed by the β and γ subunits of epithelial sodium channels and the subunit 2 of acid-sensing ion channel. Myogenic response is of fundamental importance for providing organ a relatively stable blood flow when exposed to changes in blood pressure, a phenomenon named as blood flow autoregulation. In renal circulation the autoregulation is achieved largely by the myogenic response and the macula densa–tubuloglomerular feedback response.